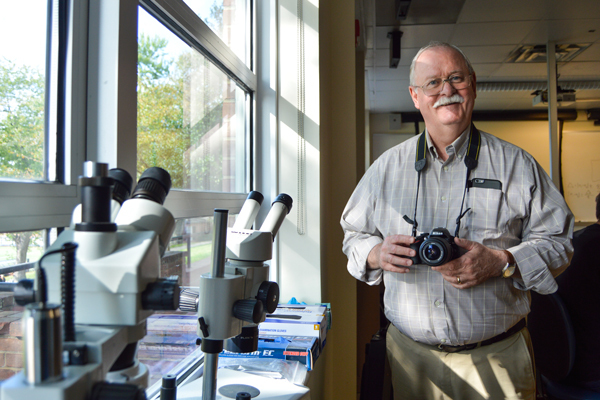 Ted Robinson, an associate professor of forensic sciences, said that a course on fingerprinting is being converted to an online format. The forensics department and engineering school will both add online graduate courses next semester. The forensics department and the engineering school are adding online courses for graduate students this spring. The two courses – which cover the science of fingerprinting and greenhouse gas accounting management – are being produced in-house with the University’s eDesign shop and will join more than 100 other online course options. Geneva Henry, dean of libraries and academic innovation, said in an email developing the courses demonstrates the University’s commitment to online learning. “Online education remains extremely high priority for both faculty and administration at GW,” Henry said. “The Science of Fingerprints” has been taught in the forensics department since 2012, but this is the first time it has been offered in an online format. The course covers the history, biology, development, classification, methodology of comparison of fingerprints, latent fingerprints and errors that students may encounter in the forensics field, according to the unofficial syllabus. Ted Robinson, an associate professor of forensic sciences, said more students who do not live in D.C. will now be able to access the course. But students can’t be too far away: Robinson said students must complete a lab component to acquire certain forensics skills. “This is the only educational way to get both a graduate education, either graduate certificates or master’s degrees, and prepare yourself to be an examiner as a friction ridge examiner or latent print examiner,” Robinson said. Shelly Brazelle, a latent print examiner who previously worked in a federal crime lab, helped design and will instruct the course. Students should be prepared to earn the certification required by the International Association for Identification by the time they complete the course. “Our whole department’s thrust is to prepare students for specific jobs, and this is a new venture for us – specifically creating courses for those who want to be fingerprint examiners,” Robinson said. Eventually, the forensics department hopes to move the entire graduate certificate in fingerprint analysis to an online format, Robinson said. And engineering courses are also moving online: “Greenhouse Gas Measurement and Reporting” is the first of four existing courses to move online in the greenhouse gas management graduate certificate program which will teach students how to accurately report on greenhouse gas emissions and advise business leaders on environmental practices. The Environmental and Energy Management Institute in the School of Engineering and Applied Science is working with the climate change think tank First Environment to develop the greenhouse gas accounting course. Kristy Cerullo, marketing director manager at First Environment, said the course will focus on the teachings of greenhouse gas accounting experts like Tod Delaney, the president of First Environment. “Students will also gain knowledge that will help them advise business leaders on the implications of a GHG inventory, including financial benefits, reputational benefits, and how it can improve their organization’s long term carbon footprint and handprint,” Cerullo said in an email. Joe Cascio, co-director of the Environmental and Energy Management Institute, said the course is one of four online courses graduate students can take to earn certification in a new greenhouse management program. Online courses are cheaper to run because they do not require classrooms and can have higher enrollment, Cascio said. Henry, dean of libraries, declined to provide information about how much the courses cost to produce. The 12 credits students earn from the four courses can also count as half of the credits necessary to earn a master’s of science degree in environmental and energy management, Cascio said. Cascio added that the first course is only being developed in English, but the faculty that run the program hope to eventually offer it in Mandarin, too. This article appeared in the October 6, 2016 issue of the Hatchet.